(Joe) up where we wanted to be for only $60. What a rip-off! Nothing like Cairo. But what else are you going to do at 1am? So we settled in for 3 nights at the Star Pension for $35/night (total). Not a bad room. 3 on beds and 3 on mattresses on the floor. Sam and Matt slept together. 11am Friday morning brought us to the Backpacker's Inn, a couple of doors down for brunch. Egg/mushroom/onion sandwiches were about $3 each. Chris had tuna, though, for about the same. This was the 1st full day after his burn and he wasn't too happy. On to the Blue Mosque, but it was closed for prayer. More on it later. 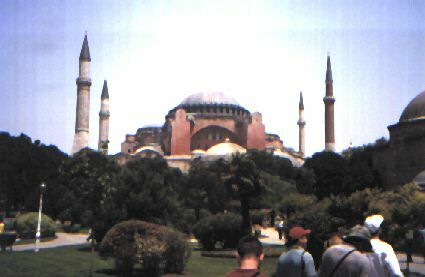 The Hagia Sophia was right across the square, so we headed for it. $2.50 for one person. As you approached, you could tell that it was truly an immense structure. How did they build things that big back then? Upon entry, you could look up and see the largest dome built until the 13th century. This was the magnificent church that Justinian built in 548. Too bad it was later converted into a mosque and then a "museum." Pictures from Greg will show some of the surviving mosaics: one of Mary and the Child Jesus, one of Gabriel, a couple of Christ, and one of the Empress Zoe and Constantine IX. Since most of the major sights weren't too far from each other, we walked the 2 days we were in Istanbul. After the Hagia Sophia, we headed over to the Topkapi Palace. It was evident by then that the beach the day before in Tel Aviv had taken its toll on us. Everyone was hanging and we trudged thru the Palace. It was quite a structure too. The Turkey Muslims were very decorative. Very few areas inside were without some type of design or fancy tile. Again, as far as the Blue Mosque goes, it was impressive and all, but it was built 1,000 years after Sofia by Suleyman the Magnificent to top the Sofia, but I don't think it did. The Sofia just seemed well, roomier, if I can use that word. 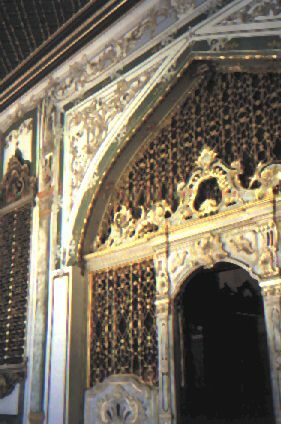 The palace was the handiwork and command center of the Ottoman Empire. We saw museum type stuff (old) and some neat stuff (several foot prints Muhammed made in stone; several hairs from his beard; several swords of dead Caliphs, Muhammed's bow and sword, and not in the least, a box that happened to contain the tooth of Muhammed.) I'm not sure if tooth meant his tooth as in there was only one tooth, or that they were trying to convey that one of his teeth was in the box. Nevertheless, we saw neither tooth nor teeth, but we did see the box. After this grueling tour, we had a bite to eat at a world renowned restaurant called, believe it or not, Medusa. (Joe) Yes, the House of Medusa. And it was here that the time came for the T-weeds to separate. Chris was tired and in great pain and Greg was extremely weary. So, Chris and Greg headed back to the Star Pension. The rest of us hiked across town to the Grand Bazaar. Boy, was it grand. Even inside here you could find an expansive, covered, decorative structure. 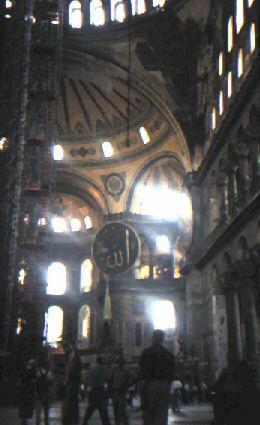 The ceilings were high with numerous arches and painted designs. It was so large that you could get lost there. But we didn't. (Chris) In fact, they made it back to Star Pension, where Greg's and my laziness became contagious. All chatted and dozed off to sleep except Matt who insisted that he needed more from a Friday night. Matt went across the street to the Orient Hostel where there was some serious partying going on. The main attraction was the belly dancer who twirled around the bar to the strains of 3 men on strange and alien instruments. She was only vaguely attractive, but was good at the dance and even better at making fools of her audience. One by one, she lured the audience members to the dance floor. The girls were embarrassed because their attempts to belly dance were horrible. The boys were embarrassed because she made them bare their chests and (in one case) boxers. Matt knew he would be lured up there soon, so he ran out of the room to escape almost certain temptation. They later played the 8o's song Rasputin which Matt devoured with an unearthly delight. He returned to us innocent ones with horns and a pitch fork. You could say we slept with the devil that night.